If you have sheep, alpacas or goats, spinning their fleece is a truly hands-on way to make something beautiful from your land. 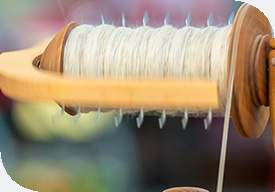 Whether it’s to make the best use of fibre from your animals, to relax to the soothing rhythm of the treadle, or to make something completely unique, there are many reasons to try spinning. Handicrafts can also generate an income and always make wonderful gifts. Once you’ve shorn your animals the fleece needs to be scoured, or cleaned. To scour your shorn fibre, soak the staples, which are the naturally-formed fibre clusters, in hot soapy water for about an hour, rinse in warm water then squeeze and leave to dry. Once clean the staples need to be prepared for spinning using a process called carding, which teases the ends and makes the fibres more parallel. You can buy simple hand carders or invest in a drum carder. Spinning is straight-forward and most people pick it up in a few minutes. Simply attach fibres to a leader thread and draft the fibres out; drafting is the process of introducing the twist. The spinning wheel twists the fibres into a yarn and collects it on a bobbin. Once twisted, the fibres form a strong single-ply yarn which is usually plied together with one or two more threads. Wash to set the twist, then your yarn is ready for knitting or weaving.